This is the "first fire" which is lit (at our church and many others) at dawn on Easter Sunday. We light our Pascal candle from the fire, then we all light little candles from the Pascal candle and bring the light back into the church which has been dark and undecorated since Good Friday. We arrived at church at 6am (which felt really early with the clock change) for a beautiful service followed by bacon sarnies, hot drinks, croissants and some fizz. The fizz is because it's a very holy day for Christians. Today we celebrate our belief that Jesus rose from the dead. We eat a lot of chocolate eggs too! Whatever you believe (or don't!) I wish you a very Happy Easter! Wow, yes that would feel early! At least you had a lovely breakfast provided. What a joyous day, Happy Easter! Thanks Anne - the breakfast was very welcome! It was quite a long day though! Ooo 6am start!! Looks nice and toasty though. Happy Easter to you. I may have snuck back to bed for an hour afterwards! 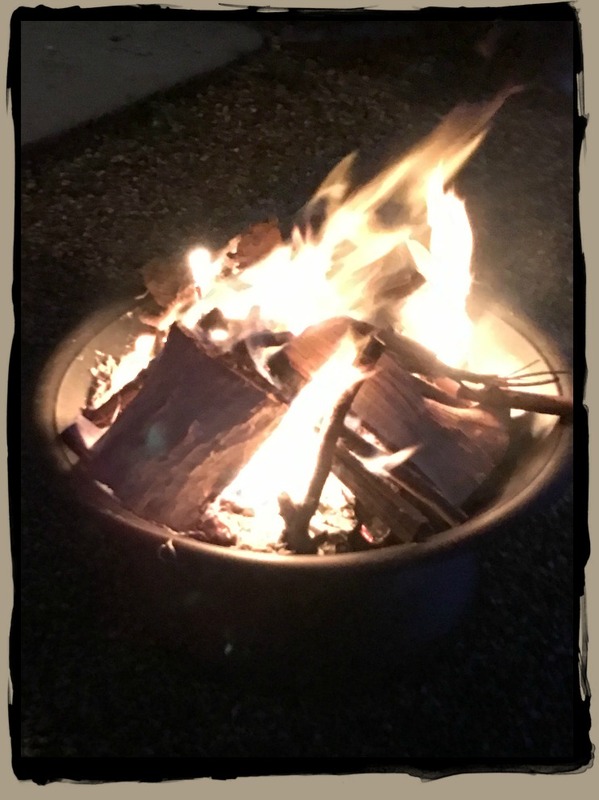 It was my husband's fire pit so we are now calling it the holy fire pit! It was nice but was a bit worried about the vicar's cassock catching fire!